Joe Pigott’s goal deep in second-half stoppage time defeated Rovers at Kingsmeadow. With chances few and far between in the opening forty-five minutes, Liam Sercombe came closest to breaking the deadlock, as the midfielder’s driven effort from outside the Dons area was deflected off target by a crucial block from Deji Oshilaja. Inside the closing twenty minutes, a powerfully struck shot from Joe Partington tested George Long, with the Dons ‘keeper able to push Partington’s attempt wide of the target, while Adam Smith made a comfortable stop to deny Harry Forrester from range. In the build-up to the game, Manager Darrell Clarke opted to made four changes to the side that started Tuesday’s victory over Rochdale. 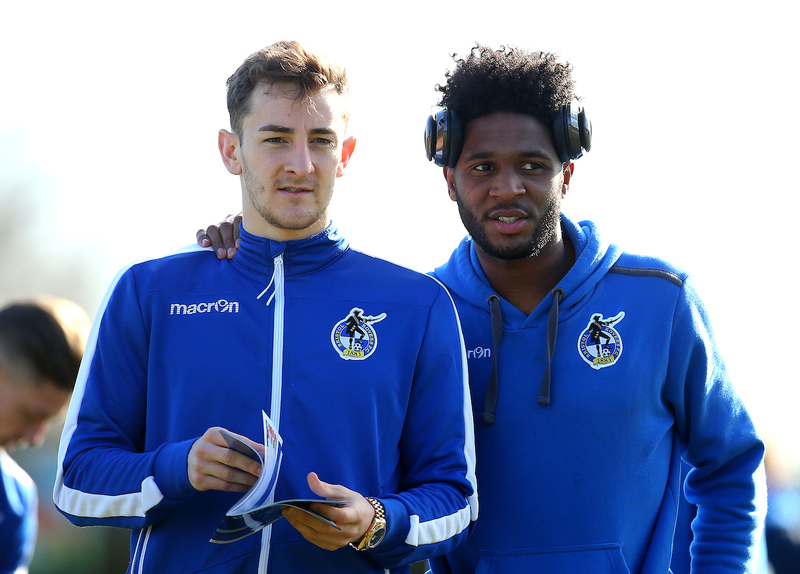 Captain Tom Lockyer made a welcome return to the starting eleven, featuring for the first time since January’s fixture against Bradford, while Marc Bola, Kyle Bennett and Ellis Harrison were all included on the teamsheet to face to the Dons. During the opening phases of the encounter, Rovers enjoyed the majority of the possession on the narrow surface at Kingsmeadow. A heavy challenge on Stuart Sinclair inside the final third lead to Kyle Bennett working a disguised quick free-kick to the open Ollie Clarke, but the midfielder couldn’t quite force a shot on target from outside the area and had to settle for a chipped ball into the box that was cleared away by the Dons defence. 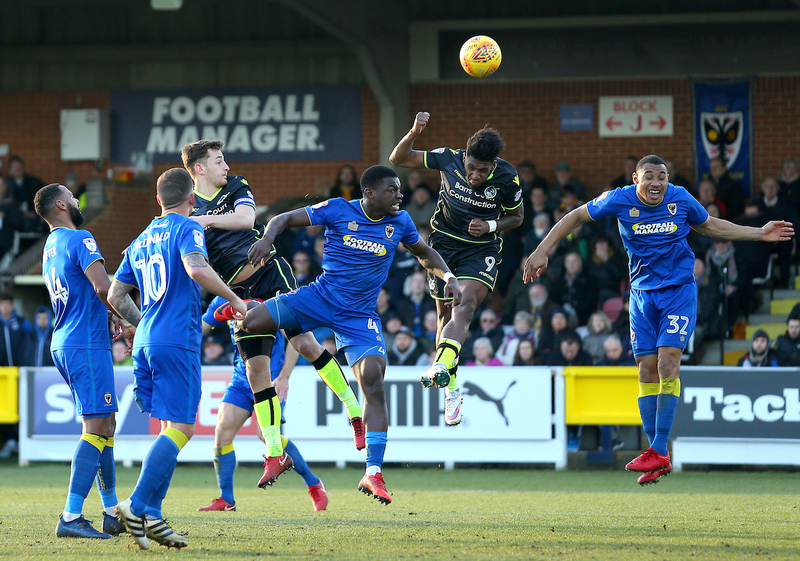 Ellis Harrison looked to keep the AFC Wimbledon defence occupied with his movement, with the striker pulling Darius Charles out of position to meet a Chris Lines cross into the area, but the striker’s glancing header flashed wide of the target. It was the hosts who registered the first shot on target, as Cody McDonald controlled a bouncing ball on the edge of the Rovers area and was able to evade the challenge of Tom Lockyer. The striker managed to hit a powerful volley towards the target, but for fortunately for Rovers McDonald’s attempt nestled straight into the arms of Adam Smith, who had burst of the goalmouth to narrow the angle. A flowing move down the left that involved the combination of Chris Lines, Kyle Bennett and Marc Bola carved out an opportunity on goal for Darrell Clarke’s side midway through the first-half. Bola managed to find space deep in the final-third to deliver a cross into the area that found Liam Sercombe. The midfielder was able to take control of the cross and lay-off a pass to Ollie Clarke, who saw his right-footed effort flash narrowly past the upright. Rovers enjoyed success down both flanks, as both Chris Lines and Joe Partington fired dangerous driven crosses from the right that required Dons ‘keeper George Long to take action, with the shot-stopper almost spilling Lines’ delivery into the path of Ellis Harrison, who was made a darting run to attack the ball at the near post. In ten minutes before half-time Rovers looked to impose themselves on the game and almost went ahead as Ellis Harrison made a forceful run in behind the host’s defence. As Ellis arrived at the edge of the area, he looked to switch the ball to his right-foot but saw a stray boot deflect the play into the path of the onrushing Liam Sercombe. The midfielder had the opportunity to look up at goal to direct a low effort towards the target, but a block from the backtracking Deji Oshilaja prevent Sercombe’s effort from finding the target. It was another Chris Lines set-piece that created an opportunity for Ellis Harrison. Lines’ floated free-kick was played into the path of Harrison’s run, but meeting the ball unmarked, the striker could only direct his header back across goal and wide of the target. Following his recent form in front of goal at the Mem, Joe Partington almost added an away goal to his collection, as the defender saw his forcefully struck effort from outside the area test George Long, who could only push Partington’s effort wide before collecting the loose ball at his second attempt. With limited time remaining in the encounter, both sides upped the urgency to create chances. 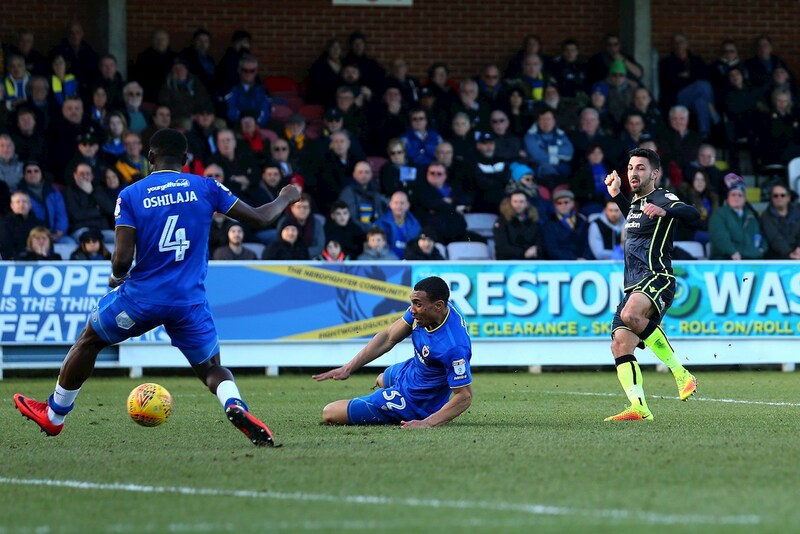 Rory Gaffney couldn’t take advantage of the ball breaking to him inside the AFC Wimbledon area, with the Dons defence quick to block the striker’s sight of goal, while Harry Forrester saw his long-range attempt easily gathered by Adam Smith. Rovers XI: Adam Smith (GK), Joe Partington, Tom Lockyer (c), Tony Craig, Ollie Clarke (44′ Byron Moore), Chris Lines, Stuart Sinclair, Liam Sercombe (73′ Tom Nichols), Kyle Bennett, Ellis Harrison (73′ Rory Gaffney). 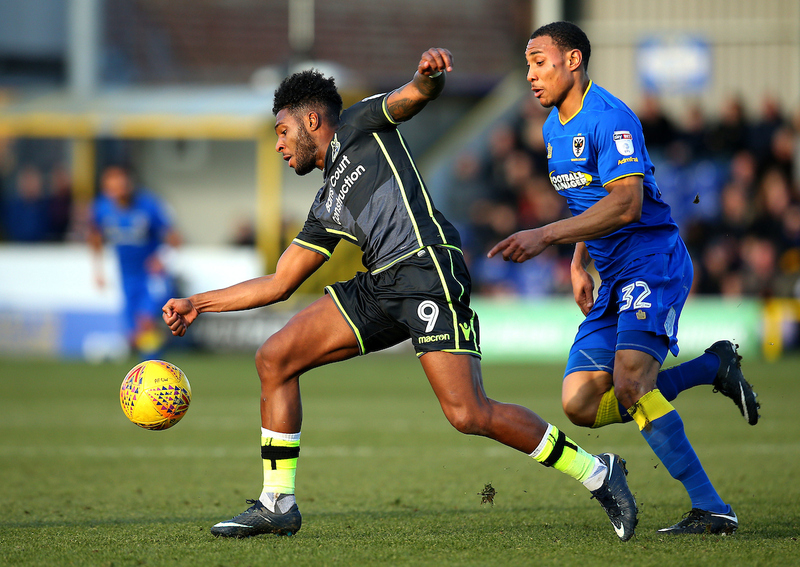 AFC Wimbledon XI: George Long (GK), Barry Fuller (c), Jon Meades, Deji Oshilaja, Darius Charles (63′ Harry Forrester), George Francomb, Liam Trotter, Jimmy Abdou, Cody McDonald (69′ Joe Pigott), Lyle Taylor, Andy Barcham (88′ Tom Soares).